Fritillaria is a beautiful plant belonging to the lily family. It is commonly found in the Northern Hemisphere- North America, Mediterranean, Southwest Asia, North Africa and the Eurasian countries. Fritillaria species come in various types and the one containing small corm has been found to be more beneficial in terms of medical point of view. But the disadvantage here is that it is difficult to find small corm specie of fritillaria such as the fritillaria cirrhosa. Also the cost to this plant is expensive. Thus, in the absebce of the small bulbs containing plant, fritillaria thunbergii has been used as a substitute for this plant. Fritillaria produces a bell shaped flower. It blooms in the spring months. It has varieties of species of which some of the flowers tend to produce foul smelling odor such as F. agrestis, Fritillaria imperialis. The bloom appears in yellow color. Not all the Fritillaria produce foul smell, there still are some that produce good smell too, such as F. striata. Like most of the other plants, fritillaria has some traditional medicinal uses. F.verticillata, F. cirrhosa etc are the species of the fritillaria are used to cure cough, inflammation. When consumed in a large amount, fritillaries can result harmful/deadly too. Apart from the harmful effect of the fritillaria, it has some helpful uses too. It has been used in the treatment of lump problems. In other words it has been used in the treatment of cancer. 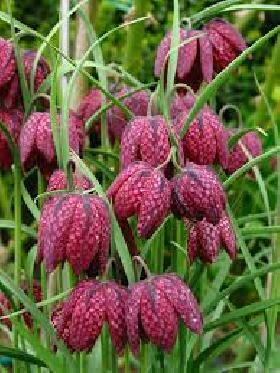 Fritillaria has been used in the treatment of cough, it is added to the cough syrup. Other than this, fritillaria powder when added steam serves to be very helpful treatment of cold. Fritillaria constitutes of alkaloid which serves as a good treatment of reducing blood pressure, muscle relaxation and also for the treatment of bronchitis. Despite the essential uses of the fritillaria, it contains some adverse effects too. Fritillaria is used as a food herb in some dishes, yet still, excess consumption or consuming this herb without notice to the condition of your health can result fatal. Isolated fritillaria alkaloids when consumed in high dosage leads to pupil dilation, tremor, heart rate decrease, blood pressure, salivary secretion etc. Here are some of the herbs belonging to the lilaceae family. Fritillaria cirrhosa/thunburgii bulb has strong medicinal uses for example: this has long and is still used as a medicinal herb in treating dryness of the throat, in other words it helps moisten the dryness caused due to cough and cold. It helps control cough and also helps in the phloem production to resolve dryness. Anemarrhena asphodeloides has similar uses to fritillaria; it helps moisten dryness and serves in the good treatment of cough leading to fatigue. It helps clear heat. Lilium brownii is a bulbous plant belonging to the lily family. It helps moisten dryness of throat, clears the heat caused by cold and also helps control cough. Asparagus lucidus tuber has effective medicinal uses; it helps control cough, subside dryness caused by cough, controls cough, clears heat etc. Ophiopogon maimendong and yu-chu also have similar uses. Fritillaria is considered as a delicate, beautiful, useful and exotic plant. Although fritillaria has a number of species, its care is same. It is considered as a true lily that gives out the most showy flower. Fritiillaria pudica, fritillaria meleagris, fritillaria affinis etc are some of the species of the fritillaria. It has been found that the fritillaria grows best when planted in partly shade to partly sunny environment; which means it has the ability to survive in different environment temperature provided that it receives some amount of light. It requires moist soil with rich amount of manure. When you plant Fritillaria, make sure that the soil is well drained because it will not in soggy soil. It will eventually start to grow in the autumn month. It is also suggested that you provide some amount of water and nitrogen feed during its growing stage. One of the biggest advantage of planting Fritilaria is that it is deer, rodents and squirrel resistant. Thus, it also helps keep the other plants away from harmful agents. Once the bloom starts, you are more than welcome to cut the worn stems, and worn flowers as well. However, keep in mind not to cut off the foliage once it starts to worn out, the foliage helps in carrying out the photosynthesis processes and this in turn strengthens the bulb preparing it for the next season. Fritillaria thunbergii also known as thunberg fritillary, zhe bei mu is commonly found in the hills, forest, moist and shady places at an altitude of 600m elevation. It grows well under the deciduous shrubs and small trees. It has been used for medicinal purpose for many years and is also regarded as an ornament plant. However, it also has some drawbacks for it contains alkaloids and if ingested at an excess amount, it turns out hazardous. It is commonly found in China and Japan. To get this flower bulbs for free, simply Click Here to apply.